When I can open the ‘Return & Refund’ dispute? You can request a ‘Return & Refund’ within the following time frames based on the shipping method that was used. ?5-90 days if your package was shipped via UPS, FedEx, TNT, DHL or USPS. ?7-90 days if your package was shipped via EMS, E-packet or E-quick. ?10-90 days if your package was shipped via regular post such as China Post, Hong Kong Post, etc. Evidence and expected solutions/requests are required when buyer is making a return & refund request for Item(s) not as described. Evidence is required to be uploaded through the system when the buyer is escalating and changing the dispute reason to “Item not as described”, or the system will automatically release payment to the seller 3 days later due to lack of evidence. The seller is required to upload evidence for Items “Not Received” cases, or the system will automatically issue a refund to buyer. Seller has to response buyer’s request within 5 days from the date case was opened. If no response within the time frame agreed, our system will automatically issue a refund to buyer. When buyers can ‘Request NGY?mediation’? Buy and seller have 10 days to communicate. When seller is not cooperative, buyers can click the ‘Request NGY?mediation’ button to escalate the case to NGY?Resolution Center 3 (VIP) or 5 (regular customer) days later after the return & refund case opened. The NGY?Resolution Center will provide a solution for buyer within 10 calendar days from the dispute escalated to NGY. What can buyer do if the order completed or payment released? If an order has been completed and payment has been released to the seller, the customer can still open an after-sale dispute for “Item(s) not as described” within 30 days from the payment released date, “Item(s) not received” cannot be opened again, buyer needs to contact with seller. Why I cannot open a dispute? For personal products, such as underwear, wedding dress, etc., dispute cases should be opened within 7 days from the date the buyer received the item(s). NGY?resolution center will commence arbitration in accordance with the terms set forth by the seller. This applies to any Return & Refund requests from buyers, unless there any outstanding after-sales service terms previously set-forth by the seller. If there have been any terms set-forth by the seller in the after-sales service terms, then NGY?resolution center with determine the outcome based on any discrepancies on the sellers’ terms. If buyers wishes to return the item(s) for any reason, this should be subjected to seller’s after-sale service terms including custom-made & personal items such as underwear, wedding dress, etc. DHgate Resolution Center will commence arbitration based on both the after-sale service terms and actual dispute case. More details about the four dispute reasons, please check following. Notes: Learn more, please browse following status. If the item(s) shows as “still on the way to the delivery address”, you can request a “Return & Refund” only after the delivery time has exceeded that of which the seller has promised. NGY?Resolution Center will arbitrate based on the seller’s promised date and the actual shipping status. Once the item(s) are in the local sorting facility or post office waiting to be picked up, the buyer is responsible for collecting their package. If the buyer refuses to do so due to some personal reasons, NGY?Resolution Center will commence arbitration to release payment to seller. If the buyer refuses to collect the package due to item(s) or seller’s problem, then NGY?Resolution Center will offer a full refund to buyer. 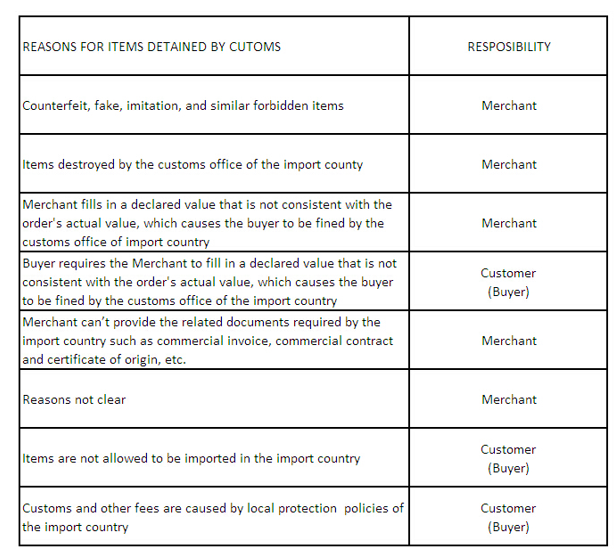 If a shipment exceeds the estimated delivery date promised by the seller, and is detained by customs, the buyer should provide a copy or photo of the customs letter confirming the delay. Table 1. Indicates potential reasons for customs issues and which party, seller or buyer, should be held responsible for the delay. - NGY?Resolution Center will allow the seller to retain the shipping cost after an official invoice has been provided by the seller, and the balance of payment will be refunded to buyer. - NGY?Resolution Center will decide to give a full refund to buyer. Including but not limited to tracking information, NGY?Resolution Center will check other tracking information such as city, postal code and consignee. Payment will be released to the seller if above-mentioned are all correct. Status: Buyer refused to sign for an item? If an item arrives to the delivery address and the buyer refuses to sign for the item(s) because the shipment was delayed or the package arrived damaged, the seller will be responsible and a return and refund will be processed by NGY. If the buyer refuses to sign for the item without any reason, no reasons found by NGY?Resolution Center or NGY?Resolution Center didn’t get any evidence from the buyer, then the customer will be responsible for paying both the shipping cost and return shipping cost. When there is no complete delivery information after the promised delivery date and the payment amount is more than US $100, the seller will need to provide DHgate with evidence, which can prove the package was signed. A full refund will be issued if the seller fails to provide the necessary evidence or the evidence provided is not valid. This term can also apply for any agreement regarding sending a replacement. If a valid tracking number is uploaded after the shipping deadline, or the seller provides proof that the correct tracking number was given to the buyer, then NGY?Resolution Center will commence arbitration to issue a refund or return item according to the actual conditions. If buyer did not get the item on seller’s promised delivery time, then NGY?Resolution Center will commence arbitration to issue a refund or return item according to the actual conditions. If buyer choose fast express or abroad delivery, seller shipped with post, then NGY?Resolution Center will commence arbitration to issue a refund or return item according to the actual conditions. If there is no tracking information on the shipping carriers website after 5/7/10 days (details as the table indicates below) since the seller provided the tracking number, the buyer can request a “Return and Refund” under the reason “Invalid tracking number”. If the shipping or tracking number is located and confirmed but the delivery information is found to be inconsistent with that provided by the buyer, or the seller did not provide any shipping documents, the seller will be responsible for providing a refund. If the seller ships or is preparing to ship the item(s) when NGY?Resolution Center is still reviewing the case, and no agreement has been reached on this matter between the seller and the buyer, then NGY?Resolution Center will confirm with the buyer first, and a refund will be issued when buyer does no longer want the item.